The Aprilaire 600M 24V Whole-House Humidifier is simple to install and features a built-in bypass damper with manual control. The damper of the Aprilaire 600M 24V Whole-House Humidifier is labeled for both winter and summer making the set-up of the unit a breeze. The Aprilaire 600M 24V Whole-House Humidifier can provide added protection against common house problems such as static shock, chipping paint and plaster, splitting or cracked wood floors, furniture, trim and molding. The Aprilaire 600M 24V Whole-House Humidifier can also help with health issues such as dry nose, cracked itchy skin, sore throats, aggravated allergies & asthma. 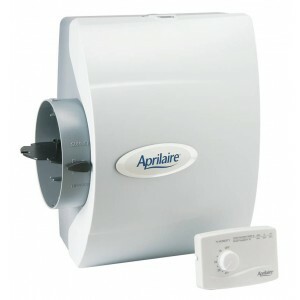 The Aprilaire 600M 24V Whole-House Humidifier is simply the best bypass humidifier on the market. The Aprilaire 600M 24V Whole-House Humidifier includes the built-in bypass damper, 24 VAC transformer, manual humidifier control, saddle valve, one water panel and the humidifier control installation sheet. By evaporating up to 0.7 gallons of water per hour, you’ll never have to experience the discomfort of dry air again! Best of all, the wide ranging effects of this device can reach all rooms in a tightly constructed home of up to 4,000 square feet! If you are all about water conservation or live in an area where standing water can become a problem, don’t wait another day to get the Aprilaire 600M 24V Whole-House Humidifier. It not only recycles water cleanly into the air, but can help eliminate water where draining is not available. By maintaining a proper level of humidity you can improve your respiratory health, and avoid costly repairs on areas of your home that can be affected by dry weather (paint, molding, weather stripping, etc.). Keeping your Aprilaire humidifier maintained allows it to perform at optimal levels. Aprilaire 600M Whole-House Humidifier does not require much maintenance at all. You should visually inspect the unit every 500 hours, more frequently during heavy use. Inspect the plumbing and water lines for cracks or leaks and replace as needed. The one item that does require to be replaced is the water panel. The water panel should be replaced annually during regular use, and every six months during heavy use. Humidifier Dimensions: Width (including solenoid valve): 15 3/8" x Height (including drain spud): 15 3/4" x Depth: 10 1/4"
This is not the first humidifier I've bought, but I got tired of cleaning the mold from my Vicks and decided to get one that directly connects to the hot water line. Much less fuss with cleaning out the container, keeps the air in our house moist and makes breathing during winter much easier. Very easy to install, very good performer and the only problem I had after the first 16 months of use was that the drain blocked and the unit overflowed down the front of the furnace. My fault, I should have done the due diligence. This unit is a very easy install, very good performer and my whole household sleeps better and doesn't wake up with eye lids glued to each other! My house is 2500sqft, two floors and has an attached garage. Works great - 10 out of 10 - don't need anything fancier than this kit.